The spiking method of aeration simply entails inserting a sharp object into the ground to create holes. 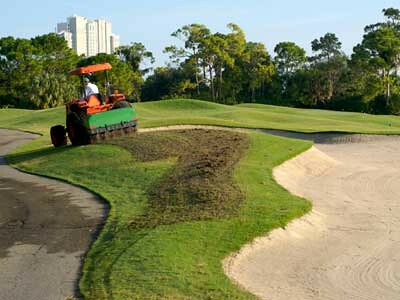 The other method of aeration, core aeration, is the much more effective method of the two methods. 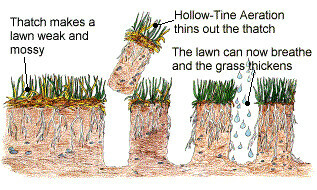 Core aeration makes bigger holes in the lawn, and it takes plugs of earth up out of the ground during the process. 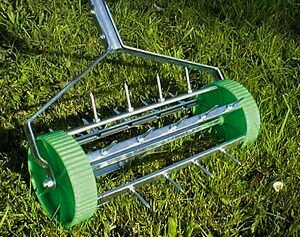 This plug removal process is the most effective means of aerating a lawn. There are loads of benefits to aeration for a lawn that is having problems. The soil that lawn grows in has a tendency to get compacted over time. This is especially true for lawns that receive a lot of usage. The large amount of traffic accelerates the compaction process. When the soil becomes compacted, it is very damaging to the health of a lawn’s root system. Compacted soil keeps the roots from readily absorbing the nutrients they need to flourish. It also keeps the roots from getting enough oxygen to stay healthy. Water in compacted soil has trouble draining, which can lead to root rot and slow down growth. Compacted soil also prevents earthworms from establishing a healthy colony in the soil. This is a major problem as earthworms are one of the best aids to healthy soil. All of these soil compaction problems can be remedied by aerating your lawn. You can buy an aeration tool to do it yourself, or you can get it done very well by using professional assistance. Either way, you need to make aeration a regular part of your lawn maintenance routine. 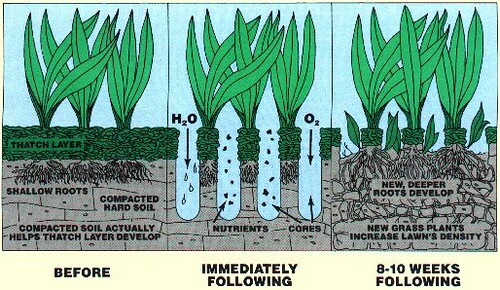 Aeration should be performed every spring and fall at a minimum. It should also be done whenever it is time to reseed a lawn. The grass seeds will be able to thrive if they have the benefits of aeration. If a lawn has problems with thatch building up, then aeration is a great way to remedy the situation. Aeration is also useful for lawns that are suffering from patches of crabgrass. If a lawn is brown, patchy or unhealthy in any manner, then aeration should be one of the fist steps considered to get it back into good shape. Peter Wendt is a writer, researcher and aspiring landscaping professional in Austin, Texas. He encourages his readers to visit an Austin lawn aeration company if they are interested in learning more about the service. Advantages of Prefabricated Steel Buildings Roof Windows: Which Kind Is Right For You?